Jeep's produced another round of their crazy Jeep concepts that we'll soon beg them to turn into something you can actually buy. Highest on the list? 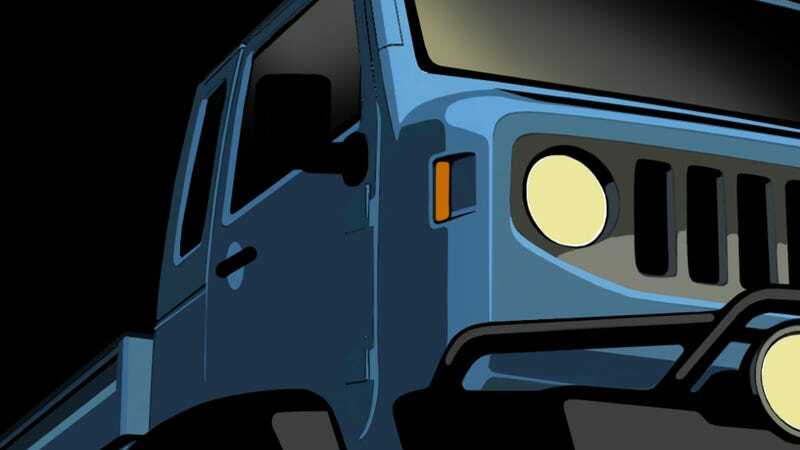 The Jeep Mighty FC, which looks like a Forward-Control Jeep modernized for the new world — something I'd never thought of until this moment but now must posses. Give me one. Give me one now Jeep. I'm not essing around here. The annual Easter Jeep Safari in Moab, Utah enters its 46th year and Jeep isn't holding back with rehashes until the big 50th anniversary. The first concept is the "Jeep Wrangler Apache" that shows a Warn-built winch and is probably their main off-road style vehicle. We can definitely say that it'll be blue-ish. An obvious derivative of the Jeep NuKizer 715, the hopefully military J8-based "J12 Concept" is another retro look without all the military style. The red plaid in the background screams VW GTI but we're into it if it keeps the old-style body. And speaking of old, there's a freaking Forward-Control Jeep. For those unawares, Jeep (in its Kaiser days) used to make these crazy cab-over (i.e. Forward Control) vehicles used mostly as work trucks. They've clearly built another one. There's a lot of internal debate over whether or not this is a modified Jeep Wrangler with an FC-style look (an amazing engineering feat) or something else. My personal hope is this vehicle is based on one of Iveco's military/industrial vehicles. A crazy thought, even if Fiat Industrial owns Iveco. It could also be built on on a Patriot platform. And then I'd set it on fire. What do you think about an FC Jeep? Are you as deliriously excited about something you haven't seen?